Dozens of new spells, from Aroden’s spellward to zone of foul flames! 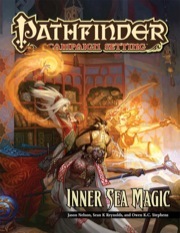 Inner Sea Magic is a 64-page entry in the Pathfinder Campaign Setting line that contains an impressive amount of information about everything from magical schools to variant types of spellcasting and more. It's full of new spells, archetypes, and even a couple of prestige classes, and I found myself impressed and intrigued by most of the options presented. I will say this is another product that seems to blur the division between the Campaign Setting line (intended for GMs) and the Player's Companion line (intended for players), as players will get as much or more use out of this book as GMs. But in the end that doesn't keep this from being a quality book that is definitely worth getting. The inside front cover is a map of the Inner Sea region with the location of important magic schools listed. The inside back cover is a reproduction of the cover without any logos or title. The contents are divided into five sections: Magic of the Inner Sea, Variant Magic, Magic Schools, Spellcasters of the Inner Sea, and Spells. Section 1, Magic of the Inner Sea, is six pages long. It begins with a brief overview (1 paragraph each) of regions in the Inner Sea that are particularly noteworthy in regards to magic: Geb, Irrisen, Jalmeray, the Mana Wastes, Nex, Nidal, Thuvia, Varisia, and the Worldwound. The rest of the section is a list of fifty(!) noted spellcasters in the Inner Sea, each with a one-line description, class and level, and a head-shot. I don't recall seeing anything like this before, but I actually really liked it. It's basically a "Who's Who" of magical power in known Golarion. My only suggestion is that it would have been better to use the inside front and inside back covers for this sort of reference information, thus freeing up a couple of pages in the interior for exposition. Section 2, Variant Magic, is ten pages long and definitely something I'll make use of. It presents seven variant systems of spellcasting that are tied to a particular region or theme, and are perfect for NPCs or (with GM permission) PCs that hail from that area. Included in this section is False Divine Magic (Razmiran spellcasters who disguise arcane magic as divine), Fleshwarping (not really a different way of casting spells, but a way to transform creatures), Primal Magic (otherwise known as "wild magic", this section includes rules on primal magic areas, how primal magic events are triggered, and a great table on sample effects that could result); Riffle Scrolls (a slightly different method of scroll-casting that I didn't really get the purpose of, either in the novel Prince of Wolves or here); Shadowcasting (drawing from the plane of shadow; this section includes four new feats); Tattoo Magic (favoured by Varisians), and Thassilonian Magic (basically super-specializing in a school of magic; includes a great picture of the Runelord Sorshen). The options presented here were quite flavourful but also seemed (without play-testing) mechanically viable. Section 3, Magic Schools, is ten pages long and presents a full rules sub-system for handling PCs who enroll at a magical school, including the cost, the benefits (socially and mechanically) they gain from their education, what it takes to avoid flunking out, and so forth. The sub-system is designed to track the students' Fame (which they earn by making Education checks a certain number of times per semester) and Prestige Points (which they earn by completing specific tasks). Fame is used to track a students' progress and privileges (everything from library access at one end to becoming a full professor and receiving a salary at the other) while Prestige Points can be spent to receive specific favors which vary based on the school, such as gaining an Imp Minion or a discount on the purchase of poisons. Formally, the system distinguishes between Academies (arcane education), Guilds (item creation), Monasteries (divine instruction), and Secret Societies (hidden goals). The following schools are detailed, each customized to reflect different entrance fees, tuition costs, exams, extracurricular tasks, and awards: the Acadamae (Korvosa's school of demonic conjuration), the Arcanamirium (Absalom's school of "practical magic"), the Magaambya (a long-standing school in Nantambu in the Mwangi Expanse), the Kintargo Opera House (bardic college in Cheliax), the Oenopion Fleshforges (fleshwarping laboratory in Nex), the Poisoner's Guild (in the River Kingdoms), the White Grotto (a bardic college in Absalom), Citadel Enferac (Hellknight stronghold in Cheliax), the Harrowed Society (Varisian fortune-tellers in Galduria), and the Crimson Citadel (Red Mantis assassins!). Monasteries receive a two-page spread that are not geographically specific, but instead lists a faith-specific award that students can spend prestige points on. Each of the core deities receive one entry. I think the concept of magic schools, and the system presented, would be fantastic fun to use. However, I think it probably would require the entire campaign to be centered around the premise, as otherwise most campaigns don't last long enough (in terms of in-game months) to make a semester structure viable. There is a brief sidebar that suggests a method to cope with this, but I think it could lead to PCs rising from students to Full Professors in the space of what could be only a few months of in-game time, which seems unrealistic. But then, Pathfinder is full of unrealistic things, so that might not be a problem for most. Where I see the Magic Schools sub-system receiving the most value is in a "Harry Potter" style campaign where all the PCs attend the same magic school and compete for fame and prestige while handling missions presented by the school (or foiling threats to the school). Section 4, Spellcasters of the Inner Sea, is a twenty-page section that tries to offer something for everyone. It's basically a miscellany of everything from new oracle mysteries to new archetypes to new prestige classes. The two new oracle mysteries are Spellscar (centered around primal magic) and Outer Rifts (related to the incursion of the chaotic evil Abyss into the Material Plane). Next, the section lists 19(!) new archetypes. This is already a long review, so I won't list them all here. The ones I've heard a lot about include Crypt Breaker archetype for alchemists (another attack on poor rogues), the Dawnflower Dervish archetype for bards (doubling the benefits of bardic performance, but limiting their application to the bard), and the Winter Witch archetype for witches (pretty much every spellcaster in Irrisen!). Most of the archetypes look pretty good, but there are a couple like Mendevian Priest and Oenopion Researcher that I think could have been fleshed out more. Last, there are two new prestige classes, each with a full two-page spread. The Cyphermage is an expert in written and runic magic from long study of the famous Cyphergate in Riddleport. I really like the flavour of this prestige class, but most of the special abilities apply only to scrolls or other magical writing (like runes or symbols), and, at least in the games I'm involved in, I don't know how useful they would really be. The other prestige class, the Divine Scion, didn't do much for me (apart from a cool picture of Nualia). This divine-focussed prestige class is pretty bland thematically, as it's basically just a super-worshipper of any faith, and the special abilities consist of getting a low-level spell as a spell-like ability and another miscellaneous bonus (tied to the PCs domains), and some other moderate bonuses based on alignment. I think it tries too hard to be available to any faith and just comes across as pretty generic. Last but not least, is Section 5: Spells. This section starts with a cool picture of the Iconic witch fighting a woolly mammoth with Ice Spears, one of the new spells introduced here. Spellcasters shouldn't be disappointed, as 39 new spells appear here, with at least a couple of options for every spellcasting class (even Alchemist and Summoner). The rich get richer, of course, as Clerics and Wizards/Sorcerors get by far the most new options. Overall, I quite liked Inner Sea Magic. The sections on Variant Magic and Magic Schools were real highlights, and I could see them adding a lot to the right campaign. The player-focussed options presented (archetypes, spells, etc.) are more the sort of thing that could be found in any book, and I wish that as a Campaign Setting book this one would have spent more time on material that would be unlikely to appear elsewhere. Still, all in all this is a solid buy. I'm a big fan of the Pathfinder game rules (core rule book, advanced player's guide, gamemaster guide, and the monster manuals) and adventure paths for their atmosphere and creativity. However a few products I bought, among others this one, don't bring this particular atmosphere that I came to expect. If you're thinking of buying this one, check first if it's really what you're after. Magic, customized and so very, very cool. Inner Sea Magic takes an in-depth look at how magic is used in the Inner Sea Region of Golarion and, in turn, a bit of how that magic affects the setting. Unlike many other Campaign Setting products, Inner Sea Magic has a quite large amount of “crunch”, i.e. game mechanics information such as new rules systems, archetypes, spells, etc., instead of “fluff”, which is story and descriptive material. This makes it a product more in the style of a book like Ultimate Magic than most books in this line. However, whereas Ultimate Magic is a generic look at magic in the Pathfinder Roleplaying Game, Inner Sea Magic looks at magic with a very Golarion-specific spin. In general, I really like that most Campaign Setting books are fluff-heavy, as that’s the kind of thing I most enjoy reading when learning about a game world. There’s enough crunch in the generic books that, unless it’s very specific to the setting, more is not really needed in a world book. As such, I had a few reservations going into this book. Most of those reservations, however, quickly subsided. This is not just a book with a gazillion new feats and spells that the game doesn’t really need. There are full details on variant magic styles that other Campaign Setting books have only hinted at, new class archetypes that explore these styles, an overview of prominent spellcasters across the Inner Sea, and details on the most prominent magical schools and academies. They are all things that can enrich any game set in Golarion. There are quite a few new archetypes in the book. Many of these archetypes will be far more useful than those in books like the Advanced Player’s Guide or Ultimate Magic as these ones fit seamlessly into the setting and bring with them the flavour of the setting. To use archetypes from generic sources, you either need to use very generic archetypes (which are less flavourful) or shoehorn them into a setting they don’t quite fit in. I love the tattooed sorcerer, in particular. We’ve heard about Varisian tattoo magic in previous books, but until now, it’s been represented by nothing more than a single feat that only grants a bonus spell and a boosted caster level to a specific school. Now, tattooed sorcerers gain a familiar that can transform itself into a tattoo and hide out on their bodies. They can create tattoos that are magical items or can store spells in their tattoos. There is actually a point to Varisian tattoos now. Overall, Inner Sea Magic is a very good book that finally fleshes out a lot of things that have only been hinted at in previous products. People expecting the usual amount of “fluff” in a Pathfinder Campaign Setting book, however, may be a bit surprised by the very high amount of “crunch”. However, it’s mostly useful and flavourful crunch that enhances and expands the setting. It will be an indispensable book for most games set in Golarion. Just announced! The cover image is a mockup, and will change prior to publication. So why is this not in Ultimate Magic? @nightflier: I imagine because this is Golarion-specific material rather than general material. Because it will be Campaign Specific information. This is just what I wanted, thanks. Correct. One way to look at this book is that this'll be "Ultimate Magic done Golarion style!" Ultimate Magic, being world neutral, means we can't use this to talk about things like cyhpermages, the Mana Wastes, named NPC spellcasters, specific spellcaster schools in the Inner Sea region, and so on. As someone who generally feels magic can be too much of a good thing, I have to say I've been jonesing for this book since I got my first teaser of Cyphermages. Don't get me wrong - I'll buy it at some point. Probably in six months, when current AP is completed. But I think that there may be some folks out there who will consider themselves cheated because that material is separated from the crunch product line. I don't remember anyone feeling cheated over the Forgotten Realms specific "Magic of Faerun" or the Eberron specific "Magic of Eberron", so I see no reason why anyone should feel cheated over a Golarion specific "Inner Sea Magic". Most campaign settings have "crunch" material that is specific to the setting, and that material very rarely finds its way into a "Core" product line. Perhaps, but that kind of nerdzerker is going to get worked up anyway. We're more interested in selling to the customers who instead look at this product as "Cool. Even MORE magic stuff! Thanks, Paizo!" In other words: allowing the RPG line to pinch off possible books for the RPG line isn't our philosophy. Thank goodness. I myself like and want more such products like this. i like the generic main hardback books. But I would like to see more books like this, things tied directly to the setting that is full of crunch with a bit of fluff. This, exactly. Having made the decision to switch from Greyhawk to Golarion after 30 plus years, I want to get my hands on every bit of setting specific crunch. My bank balance is suffering on my behalf, but there are so many excellent products on the schedules this year I just... can't... resist. I don't have a huge tolerance for fluff, though, so the only product I tend not to buy are those in the Players Companion line (sorry, but it just seems very lightweight). This, however, is GM bonanza. My kids are gonna dive into this like it was free money. Well to be fair since I am being quoted. I on the other hand love fluff heavy products. I think paizo makes a good number of them and it makes me happy. I would like to see some more crunch heavy campaign products though as well. So I like both, right now I get my Golarion specific fluff to make me happy, now just add more books that are crunch heavy, like this too. Paizo "fluff" is most often well thought out, with enough depth to get you started, but not so much that you are limited with what you can do. Plus all fluff is easy to ignore if you don't like it, but with Paizo I like it far more often than I don't. So keep up the "fluff", as long as it stays relevant and as well thought out as it usually has been. Well I am sold already on this item. Um. Bit OT. In summation; looking forward to this very muchness. WOW! Neat. This looks like a pretty exciting product. Oracle mysteries, 18 spellcasting archetypes, 2 PrC's... Yay!! The mechanics of Thassilonian virtue and sin magic? There's not really any such thing as Thassilonian virtue magic. But yeah; Thassilonian magic will be covered in this book. 18 archetypes, 2 prestige classes and... spells ? I don't know yet if I want to buy this book or not. I don't want a book that is just a "more and more spells to add to your game". Can you tell us how it will be "Golarion-specific magic stuff" and not generic stuff like the APG ? I don't really like adding more generic content to the core rules in my game (and that why I have a problem with the whole APG) but I do love add world-specific mechanics, like the prestige classes introduced in the campaign setting or the player companion lines (lion's blade, red mantis assassin, harrower, hellknight, bloatmage, living monolith, daivrat, etc.) or country-specific feats. But campaign-specific spells ? I don't see the point. I wonder how spells can be linked to a country ? Furthermore, can you tell us the list of the 18 archetypes or it is too soon ? Subscribed to the Campaign Setting line as of today. The book hasn't yet entered development, so it's too soon to start saying specifically what is and isn't in it yet, since some stuff will be cut and other things will invariably be added. The challenge for this book is for it all to be world specific. Some of it will be more world specific than other stuff, of course, but all of the prestige classes, oracle mysteries, and archetypes will be tied to elements from the Inner Sea region. One archetype that'll absolutely be in the book, as an example, is the "winter witch" archetype, for example, which is obviously tied to Irrisen. As for the spells... we've been putting Golarion-specific spells into our various books since the start. Often, they're specific spells known by NPCs, but other times they're spells associated with religions or the like. Spells used specifically by a certain faith, spells invented by in-world famous NPCs like Arazni or the Ruby Prince or Karzoug or the like, and spells that are tied to unusual regions like the Worldwound or the Mana Wastes are all examples of possible spells in this book. The new spells will take up about 15 pages or thereabouts, in any event. They'll be about a quarter of the book overall. Now is it August yet?! which now leaves me to wonder if that archetype is for witches, or wizards or sorcerers, or summoners( summon frozen delights)? Only a quarter of the book, ok, I prefer. But I don't like to have to own/use the APG (and its 6 more base classes) in order to use all the material in Inner Sea Magic. Personally I want Paizo to make stuff just for the new classes from the APG. That was one of the things that made me not buy a lot of stuff in 3.x days, lack of support. Yeah this is a cool class, PrC or what have you but I know they will never support it again. I hated that. So I just wanted to say, i am one of those glad to see APG specific support. Makes me happy. The Advanced Player's Guide is increasingly becoming a core part of our products. While I understand the fact that not all folks own the APG, I do ask those folks to accept the fact that we built the APG, in large part, to address what we thought were "gaps" in the game. Cavaliers, witches, alchemists, inquisitors, and oracles all more or less had roles in the Inner Sea region even before the APG came out, and we chose those 5 as base classes to fill those roles. (The summoner's the only APG class that didn't really have a pre-existing role in the Inner Sea region). Our hope is that by making the PDF of the Advanced Player's Guide only ten bucks, and by making the rules open so that they're free online at paizo.com/prd or at any one of a lot of other online fan-created sites, we get those rules out for folks who can't afford or don't own the APG in print form, so that if they see an element they're interested in showing up in another book, they can get to the rules anyway. We won't be doing multiple winter witch archetypes in Inner Sea magic... just one, for witches. We WILL be doing a lot of other archetypes in the book though, as mentioned. And one thing in particular I want to accomplish with this book is to do some archetypes for clerics, sorcerers, and wizards, since they got NOTHING in the APG. The rules for spellcaster schools (be they temples, wizard schools, bardic colleges, secret societies, or whatever) will be detailed in their own chapter. They're not really archetypes, but more like factions. Yah. And many not OGL being part of Pathfinder's IP. Well, the *mechanics* in this book, as always, will be Open Content. How about Inner Sea-specific familiars? Specifically, improved familiars? Pretty please? I'm a big fan of pseudodragons, so I'll pester you again for more pseudodragon variants, but this is the opportunity to explore some regional options, such as domovoy or white adder (houseguardian) familiars for Irrisen, Korvosan pseudodragon/imp, talking skull from Ustalav or Geb... You get the picture. Any chance we could see a wizard archetype that replaces the familiar / bonded object option? Any chance we could see a feat/archtype/etc. that grants a familiar to a non arcane bloodline sorcerer, bard, etc. Lots of good points in this thread. I have the APG, and so do most of my group. I'm delighted that Paizo are continuing to support it, and given that the PDF is only ten dollars it's available to most people at an affordable price. 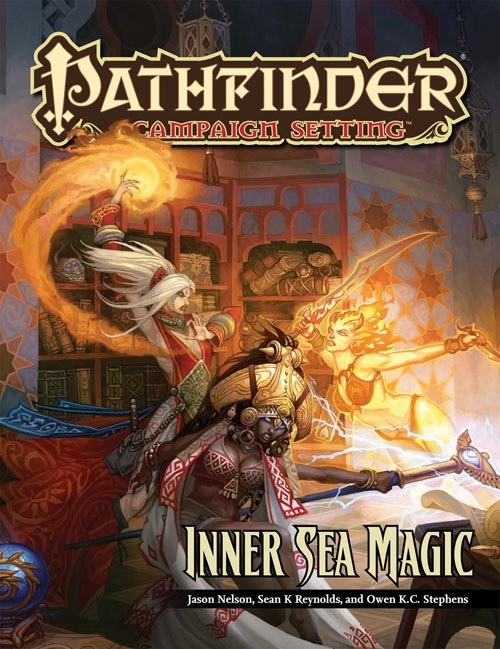 Magic of the Inner Sea looks interesting (and even if it didn't, I wouldn't be cancelling my subscription over it ...) but as a general rule I would prefer the Campaign Setting products to be mostly fluff. Actually the APG contents are available for FREE as part of the PRD.